So this is my Cotton + Steel Hexies mini - made using this tutorial from Nicole at Modern Handcraft. Hexies have never been my thing but I think this method might have changed that forever. I used all C+S fabrics as well as Netorious in Cloud Silver for the back ground. I'm loving this print in both the sparkly and white color ways for back ground fabrics - they add a little interest without overpowering the design. 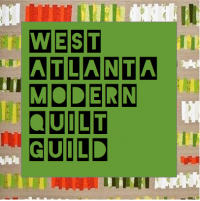 This was for a one-on-one swap with a new member of our West Atlanta Modern Quilt Guild (Rachel) and I'll share the mini she made me in a post all it's own. It's a stunner. I followed all Nicole's directions to a T and they worked great. This finished at 21" square and I was thrilled with how it turned out. Don't be surprised to see more hexies done with way around here! I just love this! Excellent work! I'm thinking about my C+S mini swap again and this has my gears turning. This is beautiful! I really want to try this method too. And yes about the Monday link up!